This is Mia from Fire Emblem - Path of Radience. I scanned it from the official strategy guide, page 39. Originally scanned at 300 DPI, Descreened on my Mac(Raine). Then transfered to PC (Yohko) so I could play with Photoshop. Despeckled 2 times and cropped. Hope people like my efforts. Thanks sooo much---this game is just awesome, isn't it?! ^-^ First case in which I actually like every character in my group (well...I'm still just on Chapter 6 XD) Haha...^-^" Thanks a bunch for uploading this because I'm trying my hardest to collect all the pics of every FE character, and obviously Path of Radiance needs the most work ^-^ (Er...and Sacred Stones, I guess). Just wanted to say thank you! I...hope you'll share more?! ^-^"
Mia is so cool. 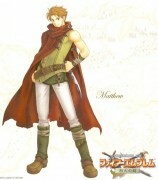 One of my favourite and most useful characters in the GC Fire Emblem. I've been looking EVERYWHERE for this! Thank you so much! YAY! Mia she is cool! Thanks for the scan!